We are more than happy to present you a little something our lab has been working on lately. As of today, the individual specs page of each phone in our database has got a new sub-page. It's called Related phones and it shows you a choice of several phones that you, our readers, have found to be... well, most related to that particular model you're looking at. We've been gathering intel on your web browsing behavior for a while now (our server logs) and we came up with a complex algorithm that gives a pretty accurate estimate of how you see rival models. We've done no intervention on our side to come up with these matches. We've tapped solely into your browsing patterns and we've come up with a statistical model that we think fairly accurately matches up phones. 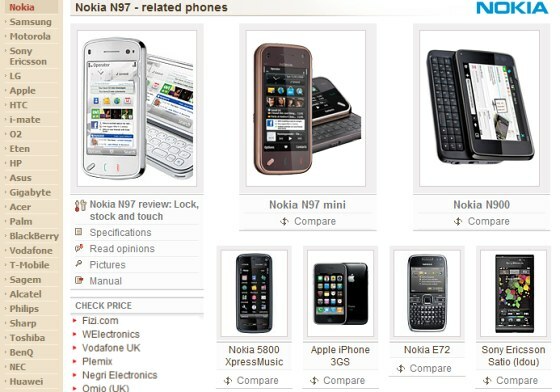 As a result each time you hit the Related phones subpage for a particular phone model you will get a list of its direct rivals at a single glance. Here's a screenshot of an example and here's a live link to see that on the website. Best of all, the list of Related models for each phone in our database will change dynamically according to how YOU see it. While we've done our best to deploy the feature throughout our full database, unfortunately, some unpopular models won't get any related results. That's simply because there's not enough statistical data gathered for the system to calculate their relevant devices. So that's about it. We'd love to hear your feedback in the comments. Now that's a very helpful feature there. It will come in handy when one is lookin to buy a new phone. One can always see the other choices he/she has by lookin at the related phones. Kudos to the GSMArena team. Excellent job, GSM Arena :) Please, keep up the good work! You are my professional adviser in terms of communication devices. Good Luck, and don't mind the people who always have something negative to say, no matter what you do :) All the best.